The mountains of Sri Lanka abound with waterfalls of exquisite beauty. Numbering more than hundred and many of them are virtually unknown, hidden away in forest or approached by steps and remote tea plantation tracks. 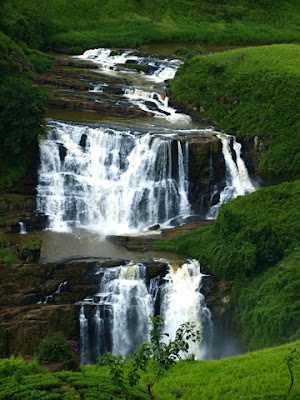 In fact for it’s size Sri Lanka has recorded water falls than another country. 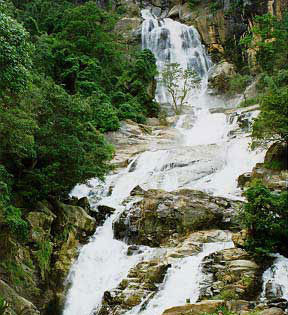 Sri Lanka’s numerous revers, fed by two half – yearly monsoons, with topography of high and steeply scarped peneplains, and rever beds of hard erosion-resistant metamorphic rock, all provide ideal ingredient for the formation of waterfalls. It is on the Ella –Wellawaya road and visible from the main road. Although the main drop is 30 ft in height, it’s a wide fall and the water rushes over several steps adding to it’s beauty.Ravana falls is closely linked in legend with the great epic of the east.Ramayanaya.It’ name is from Ravana, The powerful demon king who once ruled SriLanka.The cave hidden behind the fall is still believed by many to be one of the places where he hid the beautiful princess, Sita, after her abduction from India. Diyaluma ,on the Poonagala Oya rever off the Koslanda- Wellawaya road is another spectacular sight spilling over a straight rock wall. 559 ft in height. 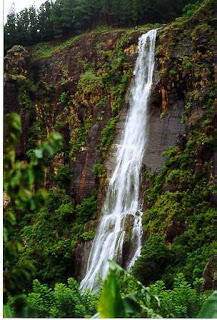 Diyaluma is often rated as Sri Lanka’s highest water falls, upstaging Bambarakanda.It is 13 km from Wellawaya town and 6 km from Koslanda in the Hills and seen like a soft veil, is seen from the Balangoda – Wellawaya highway too. Legend says that Gods, seeing the heart break of a prince whose runaway romance ended in the death of his sweetheart whom he had tried haul over the Diyaluma precipice, created this beautiful cascade to weep forever in the wilderness. Makes a leap of 100 ft on the Kurd gang, a tributary of the Kale ganga.a water fall not known for it’s height but for the sheer beauty of formation. The name Bo path Ella derives from it’s perfectly heart shaped head, much like the leaf of the sacred bo tree. It is one of the favorites picnic spot of Sri Lankans due to it’s proximity to the city of Colombo. Visitors to the Tea country get the opportunity of viewing it. 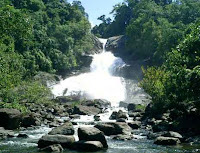 280 ft in height and viewing place for this lovely falls is from the 20th milepost on the Talawakelle –Nawalapitiya road. 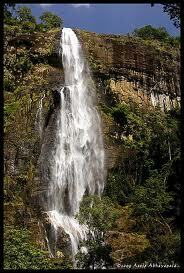 Bambarakanda is the tallest of all SriLanka’s falls.789 feet in height. It is however, a wet season fall. A glorious spectacle from October to March when heavy rains turn it in to an impressive, unbroken deluge. The main access to the falls is along a minor but mortable road via Haputale and Kalupahana.Kalupahana is 22 km from Balangoda or 32 km from Wellawaya.from kalupahana proceeding 3 km along a narrow road through Weerakoongama you come to the gorgeous waterfall.